4 October 1913: born in Tôkyô. February 1920: disciple of Nakamura Kichiemon I, he made his debut on stage (hatsubutai) at the Ichimuraza, where he received the name of Nakamura Chôtarô and played a kamuro role in the drama "Gosho no Gorozô". 1935: he became a disciple of Nakamura Moshio IV and joined with his master the Tôhô Gekidan troupe. November 1936: he became both nadai and wakaonnagata. 1940: end of the Tôhô Gekidan troupe; Nakamura Moshio IV and Chôtarô went back to the Shôchiku Company. 1941: Chôtarô settled in Kansai. September 1942: Chôtarô joined the first league of Kabuki actors ("kanbu shôshin"), playing at the Nakaza the role of Osono in the drama "Tsuchiya Chikara". February 1943: He was finally allowed to take a prestigious name, Arashi Hinasuke X at the Ôsaka Kabukiza, playing the role of Hatsugiku in the drama "Ehon Taikôki". April 1954: revival (the 1st since the end of WW2) at the Nakaza of Katsu Genzô III's drama "Ogasawara Sôdô"; Hinasuke played the roles of Odai-no-Kata and Ryôsuke's wife Okano [casting]. 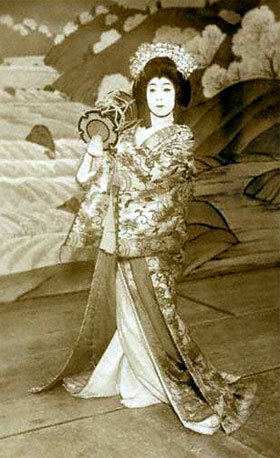 April 1960: Hinasuke played at the Misonoza (Nagoya) the role of the courtesan Okon in the drama "Ise Ondo Koi no Netaba"; the role of Fukuoka Mitsugi was played by Hayashi Mataichirô. November 1961: premiere in Kabuki at the Ôsaka Shinkabukiza of Hôjô Hideji's drama "Korikori Banashi"; Hinasuke played the role of Osome [casting]. April 1979: historic revival at the Meijiza of Tsuruya Nanboku IV long-forgotten play "Haji Momiji Ase no Kaomise" (commonly called "Date no Jûyaku"); Hinasuke played the role of Sakae Gozen [casting]. January 1981: Hinasuke played at the Nakaza the roles of Asukai and the courtesan Ôiso no Tora in the dance-drama "Kagami Jishi" and the drama "Soga no Taimen". December 1982: Hinasuke played at the Minamiza the roles of Chûzaburô's wife Okaku and Jijû Tarô's wife Hananoi in the dramas "Ninokuchi-mura" and "Benkei Jôshi". February 1983: Hinasuke fell ill while performing with Ichikawa Ennosuke's troupe in Ôsaka at the Umeda Koma Theater. 29 January 1986: Hinasuke died. Arashi Hinasuke X was an important supporting actor in Kamigata, although he was born and trained in Tôkyô, excelling in roles like Ichimonjiya Osai in "Kanadehon Chûshingura" or Oen in "Fûin Giri". He performed with Ichikawa Ennosuke's troupe in his latter years, especially in akuba roles.